Getting enough sleep can be a challenge when you’re caring for people that you love. Either they need you at all hours or you simply find it difficult to go to sleep. Try some of these ideas if you’re having trouble sleeping well. 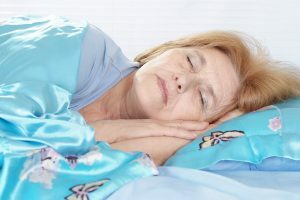 One of the ways that sleep can really elude you as a family caregiver is going over all of the things that you have to do or the things that pop into your head as you’re trying to fall asleep. You don’t want to forget any of these things, of course, but they’re keeping you awake. Start jotting those things down when they pop into your head so that you can let them go and simply slide off to sleep. Keeping them in your brain does you no good and keeps your brain revved. You probably have a bedtime routine for your elderly loved one, but how is your own? If you just fall into bed without really giving your brain and body time to ease into the idea of sleep that could be part of where you’re experiencing trouble. Give yourself a ritual that lets your body and brain wind down and start to accept the idea of sleeping. Another way to help your brain wind down is to remind yourself of all the things in your life for which you’re grateful. You don’t have to make it a different list every day if you don’t want to. Just start reciting to yourself what you’re grateful for and add new items whenever you feel called to do so. This is a great way to relax at the end of a stressful day, too. Sometimes things like a few drinks after dinner sound like a great way to get yourself ready for some sleep. At first, that might actually help. Gradually, though, you’ll find that you need a few more drinks to get the same effect. Or worse, you stop being able to sleep altogether, even with your nightcap to help you. It’s better to avoid those kinds of crutches completely. If you’re having a lot of trouble sleeping, talk to your doctor first. Getting good, quality sleep is essential when you’re a family caregiver, so do what you can to get the best sleep possible. If you or an aging loved one are considering caregiver services in Freehold Township, NJ, please contact the caring staff at Lares Home Care 1-800-781-7435 or 732-566-1112.